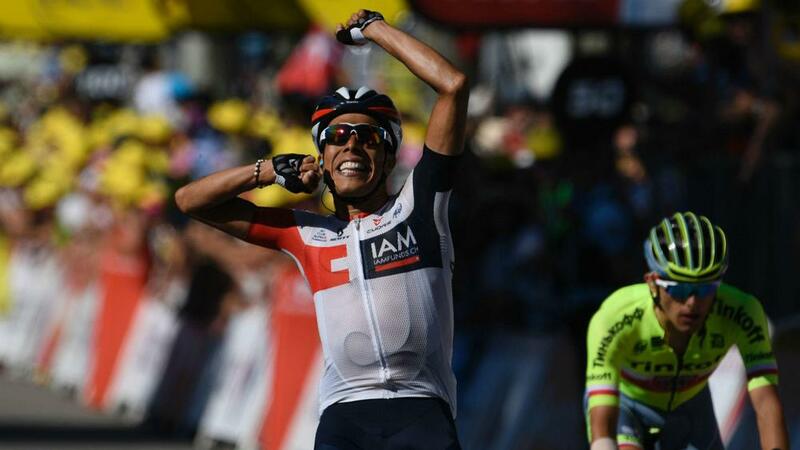 Jarlinson Pantano won a thrilling sprint finish against Rafal Majka after a gruelling stage 15 of the Tour de France on Sunday. The 160-kilometre trek from Bourg-en-Bresse to Culoz featured six categorised climbs, including the Hors Category ascent up the Grand Colombier, in temperatures pushing 30 degrees Celsius. After an intriguing day of racing it came down to Tinkoff man Majka and IAM Cycling rider Pantano to battle it out in the final kilometre. Majka had seemingly done enough to take the victory having been clear with as little as 5km remaining, but Pantano worked his way back to the front to force a race to the line. And a misjudgment from Majka allowed Pantano to slip in front in the closing metres to seal a first stage win on the Tour de France. While the action was exciting in the breakaway group, the general classification chase saw little action and race leader and defending champion Chris Froome (Team Sky) maintained his lead of one minute and 47 seconds over nearest rival Bauke Mollema (Trek-Segafredo). Majka was part of an initial 30-man break that unsurprisingly splintered into several groups. The Pole had already earned enough points to take the polka dot jersey for King of the Mountains off Thomas De Gendt by the time he reached the summit of the Grande Colombier to take 25 more points. He crossed the top with Ilnur Zakarin (Katusha) in tow and the two leaders soon had company in the form of Julian Alaphilippe (Etixx-Quick Step) and Pantano. Zakarin was dropped on the descent while Alaphilippe lost ground following a crash, leaving Majka and Pantano to battle it out. Majka went alone with 20km remaining, but Pantano's brilliant descent meant the two were reunited once again to set up a thrilling sprint finish. With Sebastien Reichenbach (FDJ) and Alexis Vuillermoz (AG2R La Mondiale) fast approaching from the chasing groups, the two leaders had to be wary of a late attack. And it was Majka who attempted to steal a march on his rival, only for Pantano to find an extra gear for a brilliant win.